Between 2008 and 2010 the art show called the Multispecies Salon traveled through San Francisco, New Orleans, and New York City. Whether individual pieces involve human/goat milk cheese, raw donkey soap, dandelions raised on human blood infected with Hepatitis C, or life-sized sculptures of transgenetic companion animals, each challenge preconceived notions of species division. More than this, the Salon begins to sketch out a “new mode of interdisciplinary inquiry: multispecies ethnography” (Kirksey et al 1) that frames The Multispecies Salon. In the collaborative introduction Eben Kirksey, Nicholas Shapiro, and Maria Brodine note that while ethnography is, “commonly glossed as ‘people writing’ […] Ethnographers are now exploring how ‘the human’ has been formed and transformed amid encounters with multiple species of plants, animals, fungi, and microbes” (1-2). Multispecies ethnography thus examines the multispecies relationships that constitute both human and nonhuman social worlds. As a methodology for writing about and interacting with nonhuman animals, multispecies ethnography instrumentalizes Anna Tsing’s increasingly influential claim that “human nature is an interspecies relationship” (qtd. Kirksey, Shapiro, and Brodine 2). Tsing makes this claim in “Unruly Edges: Mushrooms as Companion Species,” an ethnographic study of the global scientific, ecological, and commercial networks of the masutake mushroom. By bringing Tsing’s theory into dialogue with tactics of participant observation from anthropology, multispecies ethnography challenges anthropocentric claims that nonhuman animals have no voice and offers a set of rejoinders in the name of multispecies ethnography. By placing nonhuman life alongside human life in ethnographic research, Kirksey, Shapiro, and Brodine challenge anthropocentric definitions of “culture” and “species” in order to politicize nonhuman life and the interconnections between human and nonhuman life. 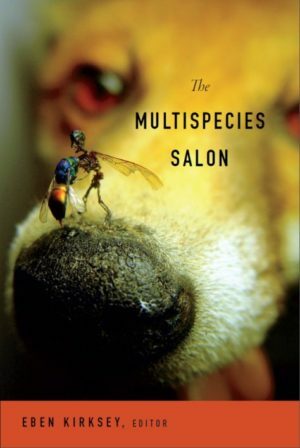 The essays collected in The Multispecies Salon take this one step further by not simply celebrating “multispecies mingling,” but asking, “who benefits, cui bono, when species meet” (Kirksey, Shapiro, and Brodine 2)? By asking, “who benefits?” Kirksey, Shapiro, and Brodine remind us that observation is often synonymous with power and privilege because it constructs a subject-object relationship between those observing and those being observed. While it is unclear exactly how multispecies ethnography sidesteps this problematic, the commitment of The Multispecies Salon to questions biopolitics and biopower specific to multispecies entanglements is rigorously maintained throughout the collection. The Multispecies Salon is comprised of seven chapters divided into three parts that correspond to three scopes of multispecies ethnography: “Blasted Landscapes”, “Edible Companions”, and “Life and Biotechnology”. The essays in “Blasted Landscapes” engage with ecological disasters and the effects they have on local human and nonhuman organisms. In his essay “Hope in Blasted landscapes” Eben Kirksey approaches a specific temporal geopolitical event, the Deepwater Horizon oil spill in the Gulf of Mexico. As the Multispecies Salon “migrated” to New Orleans in 2010, oil, Corexit, and other highly toxic chemicals from the spill began to reach the shoreline. “In the aftermath of disasters—in blasted landscapes that have been transformed by multiple catastrophes” Kirksey asks, “what are the possibilities of biocultural hope” (30)? Kirksey finds hope in local artists and activists that responded to the Horizon spill by organizing New Orleans-style parade demonstrations and risking bodily harm to save hermit crabs that were not considered important enough to save from the oil spill and Corexit contamination. In contradistinction to Jacques Derrida’s notion of “messianicity without messianism” that is “not bound up with any particular moment of (political or general) history or culture,” Kirksey’s biocultural hope involves engaging with other corporeal actors in specific geopolitical locations (35). Although inspired by Derrida’s resolution to an “affirmation of an unpredictable future-to-come” that is not “oriented toward a specific messiah,” Kirksey is hesitant to rely so heavily on a spectral, or nonfigurative, form of hope (31). “Rather than join Derrida in hoping for nothing in particular,” Kirksey writes, “rather than literally expecting the unexpected, organic intellectuals who swarmed the Multispecies Salon [use] figuration to animate the field of biocultural possibility” (57). Kirksey’s insistence upon a corporeal and figural hope is particularly relevant for posthuman and multispecies studies because it acknowledges the importance of embodied forms of resistance to biopower that operate in solidarity with nonhuman animal species toward more mutually beneficial ends. Anna Tsing’s contribution both expands and challenges the terms of biocultural hope and blasted landscape developed in Kirksey’s essay. “Ruins are our gardens,” Tsing writes; “degraded (‘blasted’) landscapes produce our livelihoods. And even the most promising oasis of natural plenty requires massive interventions to be maintained” (87). Because Matsutake mushrooms require a nutrient deficient landscape and because these landscapes give economic and corporeal sustenance to local mushroom foragers, Tsing points out that some forms post industrial disturbance can be “life giving” rather than desolate spaces void of life (88). Tsing argues that due to the fact that Matsutake mushrooms cannot be cultivated because they require long term sustained environmental disturbances, “Matsutake forests thus teach us about systems of world making and energy sharing that reach beyond the conceits of farming” (88). Tsing’s essay adds an important component to Kirksey’s conception of biocultural hope by complicating the narratives of disaster that focus on the absence and disappearance of plant specie, and pointing out how some organisms thrive where others perish. Further, Tsing pushes Kirksey’s insistence upon specific embodied and corporal analyses by focusing on the specific species relationship at the core of Matsutake picking. Part Two of The Multispecies Salon, “Edible Companions,” is more unorthodox—comprised of an interlude, four recipes for multispecies food, and an essay—and revolves around what Heather Paxson calls “microbiopolitics,” a concept she developed to call attention to the biopolitics inherent to the creation and circulation of microorganisms. Paxson expands Michel Foucault’s influential theory of biopolitics by restaging it at the microscopic level: “biopolitics, then, is joined by microbiopolitics: the creation of categories of nonhuman biological agents; the anthropocentric evaluation of such agents; and the elaboration of appropriate human behaviour, given our entanglement with microbes engaged in infection, inoculation, and digestion” (116). Microbiopolitics describes the political relationship between classic Foucauldian mechanisms of bodily control and the microorganisms that are mobilized to complete them. Nowhere is this political relationship more pertinent than with food and food regulation because not only are microorganisms used to create and preserve food for both humans and animals, they are also contaminants. For this reason, Paxson calls for a consideration of the “vital agencies” of microorganisms in order to complicate how we understand how they function as both biological and social actors (120). Microbiopolitics is central to the “edible companions” offered in the The Multispecies Salon because it offers the recipes a critical framework for making political connections between categories of “food” and “organism” (and indeed challenges the distinction) and notions of power, colonization, and control. Lindsay Kelley’s and Linda Noel’s recipes mobilize Paxson’s microbiopolitics to expose histories of colonization, and cultural loss. Kelley’s recipe for “Plumpiñon” is a play on the peanut-based humanitarian aid food “plumpy’nut” that is given to people in Northern African countries during times of extreme drought and famine. Linda Noel similarly offers a recipe for an acorn mash from that approximates a dish made by Pomo people of Northern California for centuries. “Acorn mush is microbiopolitical,” Noel states, because “it is a partial remedy for industrial agriculture, the homogenization and marketing of everything edible. Acorns are generally traded, not sold” (156). This could also be said of Plumpiñon and plumpy’nut a food manufactured in France, a former colonial empire and distributed to its former colonies in Northern Africa. As multispecies ethnographies, these recipes unearth the complicated histories of power that have shaped the current political landscape and how these histories have always involved an entanglement of species relationships. Part Three, “Life and Biotechnology,” turns to the multispecies nature of the biotechnology and genetics industries. The ethnographies in this section look closely at how science is formed from a vast network of species and sold to the public as dreams of human perfectibility and empowerment over nature. Drawing on Guy Debord’s notion of the spectacle, Kirksey, Costelloe-Kuehn, and Sagan “explore the specialization of power in biological domains [and] biographical details about hidden labourers—multiple species of animals, plats, and microbes—who sustain the life of humans and creatures we love” (185). By focusing on “multispecies spectacles” behind biotechnology, Kirksey, Costelloe-Kuehn, and Sagan begin to deconstruct the industries’ “messianic promises” of human salvation (189). One such multispecies spectacle is an art that Kate Lindsay—a scientist in cell biology at the University of California, Santa Cruz—displayed at the “The Multispecies Salon” in San Francisco in 2008. Lindsay fabricated illuminated images of Wolbachia, a bacteria common in tropical areas that is associated with two diseases—river blindness and elephantiasis—neglected by the American drug industries. The images of Wolbachia Lindsay displayed at the Multispecies Salon were produced “with the blood of rabbits, as well as ‘anti-rabbits,’ a glowing molecule generated by the immune systems of multiple other species” (Kirksey, Costelloe-Kuehn, and Sagan 190). With this in mind, Lindsay’s work helps to draw attention to these diseases by exposing their absence in the American drug discourses while at the same time showing how the anti-rabbit molecule is an example of the multispecies relationships behind the standardized tools of biotechnology. Drawing on Donna Haraway’s theory of diffraction whereby critical thinking is “marked by patterns of difference” rather than sameness, Barad argues that brittlestars open up a different kind of critical reflection tied to embodiment. The Multispecies Salon provides an inroad to a new mode of doing animal or multispecies research and offers an important methodological tool for thinking through the many assemblages of species entanglements. Drawing on a wide variety of epistemological backgrounds and geopolitical situations the book is a testament to the importance of recognizing the multispecies relationships behind human social worlds. Taken together, the three parts of the collection point to the scope and complexity possible with multispecies ethnography. From large ecological disasters, to the circulations of microorganisms, to the closed doors of biotechnology labs the book provides models for productively engaging with those political sites. Recurrently, this means opening new lines of inquiry that embrace the complex ways that multiple organisms are caught up together in their vast political, ethical, and social webs. Through this mode of inquiry, the authors in this collection point to important questions and concerns that breach disciplinary boundaries through creative forms of collaboration. Jordan Sheridan is a PhD Candidate in the English and Cultural Studies program at McMaster University. His dissertation project investigates model organisms in postgenomic genetic research. More specifically he is interested in the theories of corporeal equivalence between human and animal bodies and the roles these equivalences have in public discourses of genetics. His research interests include animal studies, science studies, ecocriticism, and material feminism.